I grew up in Oklahoma in a time of prejudice and segregation, with humor and love we'll continue to see progress. Despite the Civil Rights Movement taking place nearly 50 years ago, racial tensions remain one of the most prominent issues of today. Even in the case of a loving relationship problems can abound. That’s exactly the type of love that author Leslie Finegan depicts in her new novel, “Love and Iced Tea.” Protagonist Eiji Takezo, a young Japanese-American man, is traveling through Oklahoma when his car breaks down in front of an eccentric family’s home. As they work to help him he becomes enamored by the lovely Blair Don Mason and ultimately remains in town to court her. Unfortunately, the two come from different cultures and races, which doesn’t sit well with everyone in town. Vibrant love, witty humor and cultural clashes ensue as Finegan explores the affect of bigotry on relationships, family and community along with the wild nature of love that knows no bounds. Combining the quirky comedy of a Sandra Bullock love story with the out-there oddness of “Osage County” Finegan aims to show readers how progress can take shape in even our most remote communities. 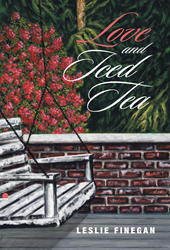 “Love and Iced Tea” combines Finegan’s experiences growing up in Oklahoma with her bright humor to bring an entertaining love story hoping to open people’s minds to cultural acceptance. Leslie Finegan graduated from the University of Oklahoma before moving to New York to receive her master’s degree from New York University. After living for many years in the New York City she now enjoys her life in Santa Fe, New Mexico.